Crafty Andy: Hats for the fun of it!!! Hats for the fun of it!!! I got this wonderful pattern from Brooke Higgins at http://knitty.com/ISSUEsummer05/PATTtychus.html, it is the easiest knit pattern for hats I have ever found. She is very talented. 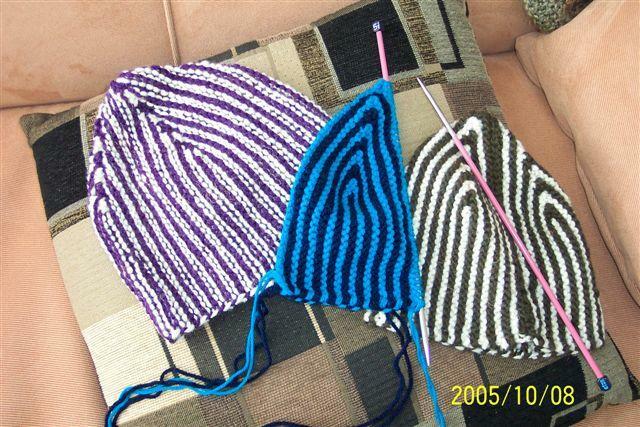 I have to tell you that I have no talent when it comes to making knitted hats with more than two needles, I get very confused. I guess that's why I don't make socks, which I have tried, but become bored easily and because it takes a lot of time for me to get something acomplished. I admit I am a sock virgin. I am thinking of crochetting some socks later this year for the first time. Right now I have two projects going, one of them is these hats, which I think are very crafty and the other is Dachshund Heidi a pattern from http://www.crochetdepot.org/. The Pattern is located at http://www.crochetdepot.org/patterns/DachshundHeidi.pdf You will need acrobat reader to be able to view it. So if you think that I am working on holidays stocking stuffers, you are so right. It is a well known fact that puertorricans like holidays and if there isn't one, we are more than happy to make a new one without hesitation. Please enjoy life and the fun of sharing a smile, a smile can change someones life. Without a smile I feel naked, I am actually blushing. Can you believe it? I have made a commitment that everyday I go out into the world I will pick up at least two pieces of trash and put it in a trash receptacle; needless to say I will never litter consciously . So do your part for the cleanliness of your city and pick up at least one piece of litter a day, if you can. We are part of the environment we are all one "Esho Funi". Some Buddhists call "esho funi" -- the idea that self and environment are two but not two. Esho funi holds that by changing myself, I simultaneously change my environment. A change can be simultaneous only if there is no separation -- no distance in time or space -- between self and environment. So at the deepest level there is no "internal" and "external" -- it's all the same place, same thing. Have a great weekend from the shores of Kalifornia.